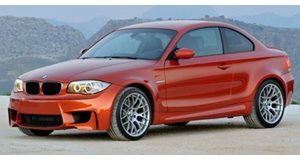 Manhart Racing adds 80 more hp to the BMW 1-Series M Coupe. Manhart Racing has recently tuned the new BMW 1-Series M Coupe, which now features a power upgrade to 420hp and new visual enhancements. Under the hood, the tuned 1-Series M Coupe generates additional power thanks in part to a newly remapped ECU and exhaust system that produces 420hp and can accelerate from 0-62 mph in less than 4.5 seconds. All told, the German tuner claims there&apos;s an additional 80 horses that give the newly tuned BMW the extra power bump. Some new exterior features include a new front spoiler lip finished in carbon fiber in addition to a unique-looking paint job featuring some interesting black decals and a redesigned diffuser. Manhart Racing has also added a set of 20-inch wheels to wrap up the car&apos;s more enhanced appearance. The interior has been tweaked to include BMW Performance bucket seats and the usual Manhart Racing finishing touches. Pricing or availability for the Manhart Racing BMW 1-Series Coupe has not been announced. Photos courtesy of Manhart Racing via BimmerToday.